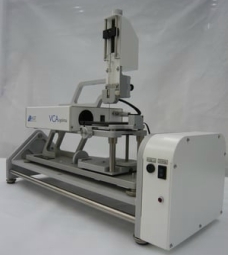 The VCA Optima series incorporates lightweight design, easy assembly, and the latest Windows™ standards and user-friendly software to create a contact angle instrument that is accurate and easy to use. VCA Optima systems are suitable for research or quality control in R&D and processing engineering. Systems range from the basic Optima to the fully equipped Optima XE. Features include dynamic capture capability, motorized syringe, surface energy analysis and pendant drop analysis, to name a few. The Environmental Chamber is sealed to provide a controlled environment for sample placement. Gas/vapor inlets and outlets allow the user to create a desired environment. The system can accommodate either a net positive or net negative gas pressure. The chamber allows for image capture through a window on the front portion of the assembly. The Heated Environmental Chamber includes a heating unit with a thermocouple feedback temperature control system. Investigations involving hazardous or corrosive gases. Minimize liquid droplet evaporation by creating an environment saturated with the liquid/solvent used. A saturated environment is important for longer time duration studies or to minimize error due to evaporation. The Heated Syringe Assembly consists of a heated enclosure which houses an interchangeable syringe. A micrometer syringe drive external to the heater jacket provides dispensing control. The unit is independently fixtured to control the height relative to the sample. The heated syringe has a thermocouple feedback control that can be adjusted to a preset temperature. The system couples directly to both the standard and heated environmental chambers. The film sample clamp is designed to grasp short segments of films or flexible tubing at two ends, providing a taut and flat surface for contact angle analysis. This unit can be mounted with supplied thumb screws to the VCA sample stage for fixed sample positioning, as well as for operation with the tilting base assembly. Maximum sample dimensions are: 1.75“ wide by 2.5“ long. Maximum film thickness or compressed tubing thickness is 1/8“; substrates up to 3/8“ can be fixture with longer fastening screws, please contact AST Products for special thickness requirements. VCA Optima is attached to the tilting stage in order to tilt the VCA. This method is used to measure advancing and receding contact angles. This tilting base is motorized and computer controlled via the VCA Optima software.